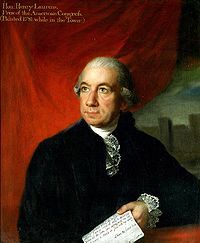 Henry Laurens (Philip Hamer, editor); Papers of Henry Laurens, (10 volumes); 1915, New York, G. P. Putnam's Sons. David D. Wallace. The Life of Henry Laurens: With a Sketch of the Life of Lieutenant Colonel John Laurens. 1967, Russell & Russell Publishers, ISBN 0-8462-1015-0. United States Congress. "ヘンリー・ローレンス (id: L000121)". Biographical Directory of the United States Congress.